Everyone likes the old Jeeps, the original Willys models that looked like World War II era army Jeeps, all boxy and plain and ready to take on any rugged terrain that muddied their way. 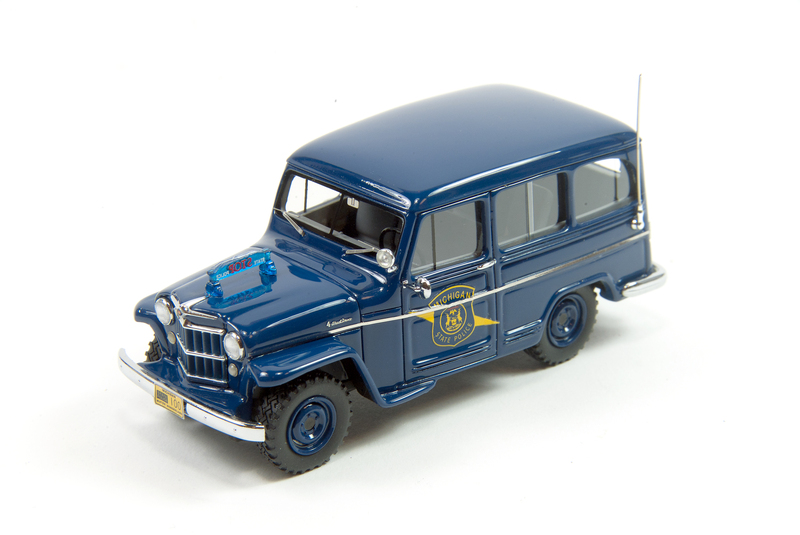 Now NEO delivers a handsome 1/43 scale navy blue Michigan State Police version of the Willys Jeep Station Wagon. It’s fun and just peculiar enough to be a real conversation starter on any model shelf. 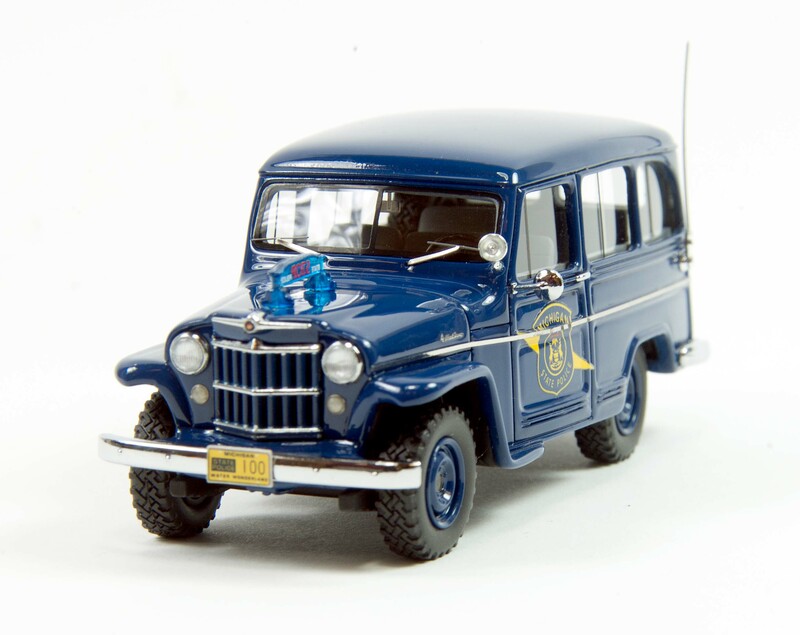 After World War II the Jeep moniker landed with Willys-Overland in Toledo, Ohio. It enlisted Milwaukee industrial designer Brooks Stevens to design a Jeep Station Wagon. This was the first all-steel station wagon made for the mass market and it was a hit, with more than 300,000 being made from 1946 through 1965. When the wagon went into production many other automakers’ station wagon bodies were still made of wood. Since Willys didn’t have the means to make its own bodies, the Jeep wagon’s bodies were created by steel fabricating companies and attached to the chassis. Many of these same companies were making large metal household appliances when not stamping out Jeep bodies. Some of the Jeep’s assets – in addition to being a high-value, low-cost vehicle – was its independent front suspension and sturdy L-134 Go-Devil flathead I-4 engine. By 1949 four-wheel drive became available to increase the wagon’s off-road ability. Think early SUV! As for the wagon, it was built in the U.S. through 1965, but was also made in Argentina by Kaiser, which had bought Jeep in 1954, through 1981. There it was known as the IKA Estanciera. NEO really delivers a special vehicle with the Willys wagon. First, it’s a bit unusual to begin with, and second putting it in Michigan State Police trim allows them to deck it out with a big rear antenna for remote police communications, plus a big chrome spotlight for the driver and a cool hood-mounted sign that urges motorists to “Stop.” Naturally there are state police crests on both front doors. Vehicles were simpler in this earlier era and there are no hub caps, just blue stock wheels exposed here and a big spare tire (remember those?) sits inside the Jeep’s rear cargo area. NEO includes a chrome trim band down the vehicle’s side, chrome door handles and a chrome gas cap. Front and rear bumpers are simple chrome numbers too, no 5 mph crash protective bumpers here. There are chrome wipers, a side mirror and grille up front and rear window lift handle on the tailgate. The model features Jeep’s V-shaped grille with five horizontal bars, which was introduced in 1950. 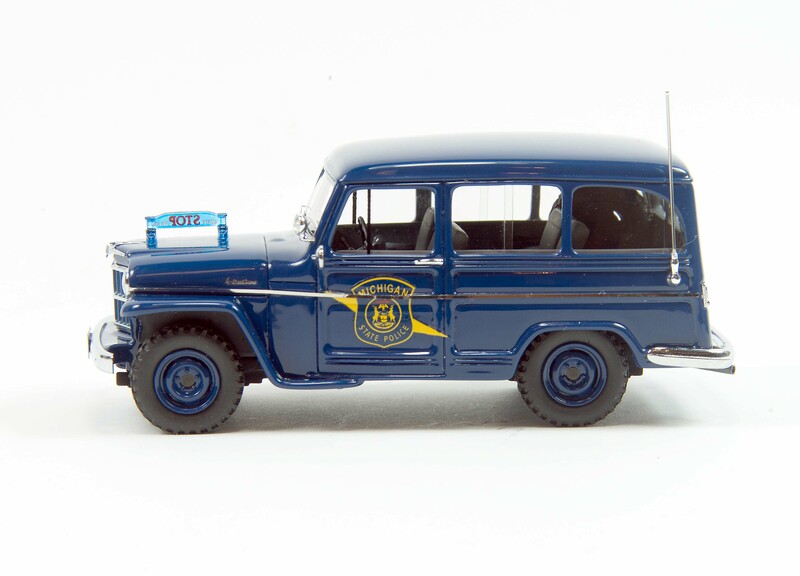 Lights front and rear are realistic and the Willys carries a yellow Michigan, “Water Wonderland,” license plate front and rear. All windows are posed in their closed positions and there’s black trim on the front and rear windows to set them off from the dark blue body’s paint. Inside the two bench seats are plain gray, as is the dash and there are simulated wood slats on the floor to create a more realistic appearance. You can see some dash detailing, plus a black steering wheel and floor-mounted shifter. 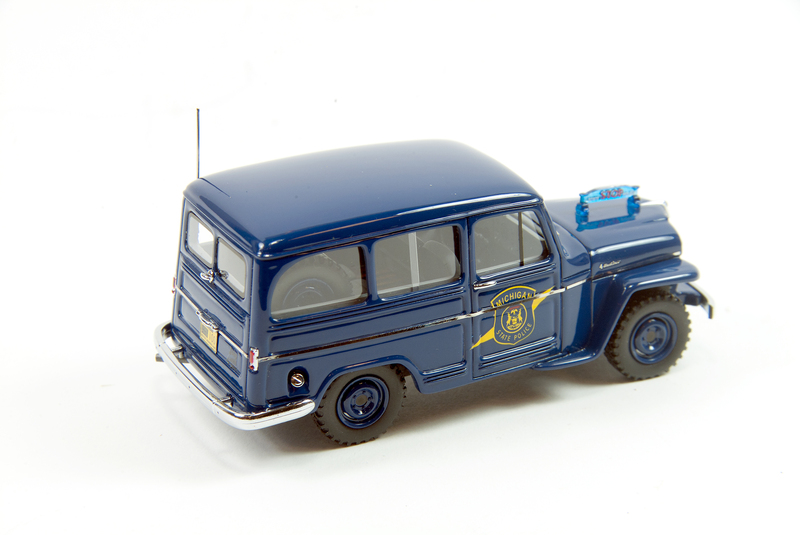 Overall the NEO Willys strikes a fine profile with enough detail to make it a standout among your 1/43 scale collection.